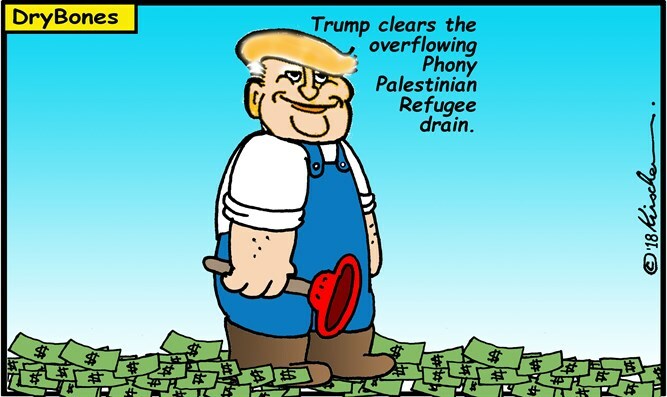 Trump turns screws as PLO creates fake news on Jerusalem and refugees. "Jerusalem is at the heart of the Palestinian, Arab and Islamic peoples"
“Palestine is the homeland of the Arab Palestinian people; it is an indivisible part of the Arab homeland, and the Palestinian people are an integral part of the Arab nation...."
Claiming the “Palestinian people” is a separate and distinct people from the “Arab people” - is deceptive and misleading. Negotiations to conclude the “two state solution” – the creation of a 22nd Arab state with Jerusalem as its capital - in addition to the Arab state of Jordan created in 78% of former Palestine in 1946 – ended in April 2014 after unsuccessful negotiations spanning 20 years. Other solutions now need to be explored that should involve Jordan and possibly Egypt negotiating with Israel to return to these two existing Arab states territory once occupied by them in Judea and Samaria (aka the West Bank), East Jerusalem and the Gaza District between 1948 and 1967. "The rights of the Palestinian people are not for sale. There is no glory in constantly bullying and punishing a people under occupation. The U.S. administration has already demonstrated meanness of spirit in its collusion with the Israeli occupation and its theft of land and resources; now it is exercising economic meanness by punishing the Palestinian victims of this occupation." The 'West Bank' currently has 775,000 registered “refugees” (up to four generations of perpetual refugeeism) - around a quarter of whom live in 19 refugee camps - all of which have been under full PLO administrative control since 1993 as designated by the Oslo Accords. Gaza has 1.3 million registered “refugees” - of whom 500000 currently live in 8 refugee camps – all of which have been under Hamas governance since 2007. The PLO and Hamas have maintained this discriminatory two-tiered refugee segregation system in both Gaza and the 'West Bank' for the last ten years. The failure to close these camps and integrate their residents into the general local Arab populations is a damning indictment of Hamas and the PLO. Expecting Trump to pick up the tab whilst the PLO continues these inhumane practices for crass political purposes - and financial ones - is arrogant and unwarranted. The PLO’s outright refusal to negotiate with Israel on Trump’s long-awaited peace plan - inflamed by these latest false claims – only ensures the PLO’s increasingly-rapid slide into political irrelevance.